California has been battling brutal wildfires this year, as the drought has dried up fields and forests across the state. Last week’s Butte Fire threatened thousands of acres and burned hundreds of homes, and it seemed like as soon as it was contained the Valley Fire in Lake County was blazing. 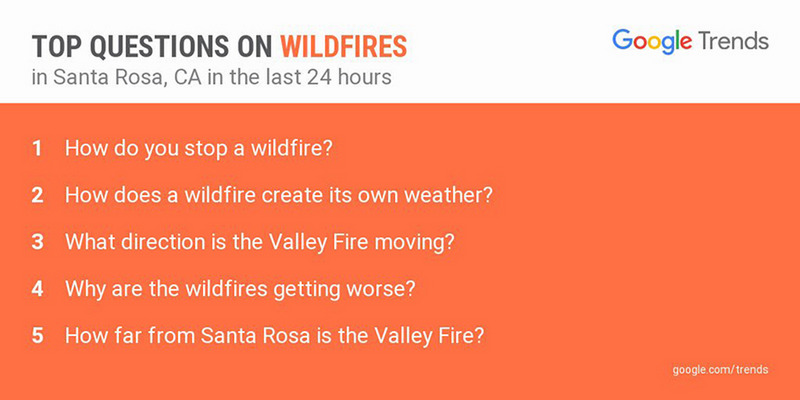 Searchers turned to the web with questions like “How does a wildfire create its own weather?” and “Why are the wildfires getting worse?” But while firefighters worked around the clock up north to stop the inferno, southern California was breaking records for rainfall. Really. Tuesday was the second-wettest day in L.A. in September since 1877, with 50,000+ searches for [weather Los Angeles] as astonished Angelenos looked to learn more about this unfamiliar wet stuff falling from the sky. Mother Nature wasn’t through with her surprises, though. Wednesday, an 8.3 magnitude earthquake struck off the coast of Chile, forcing 1 million people to evacuate—and causing 2 million searches for [Chile earthquake]. Tsunami warnings were in effect as far away as California, Japan and New Zealand. Despite some casualties and billions of dollars’ worth of damages, experts say that Chile’s investments in structural reinforcements and other earthquake preparedness prevented the disaster from being much worse. 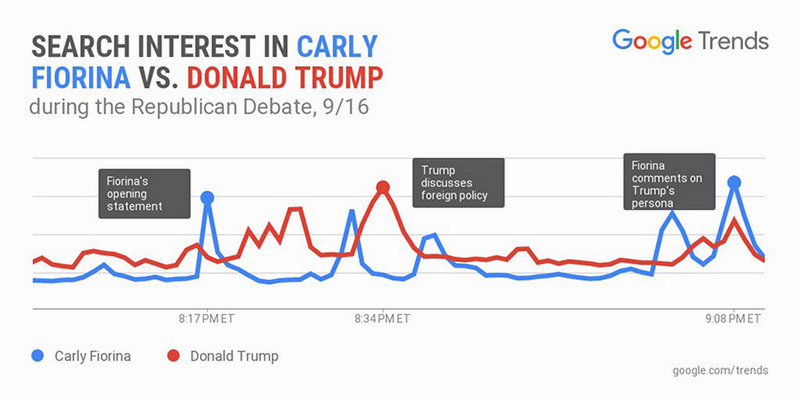 The Republican presidential debate was the subject of more than 5 million searches this week as people looked for more about the candidates and issues. While Donald Trump was the most searched candidate both overall and in nearly every state, he had some competition from former Hewlett-Packard CEO Carly Fiorina. Fiorina drew attention for her performance in the debate, in particular her opposition to Planned Parenthood (the subject of more than 200K searches this week) and her reaction to comments Trump had made about her in the press. Taking Trump to task for past comments was a theme on Wednesday; in fact, the top searched moment of the night was when Jeb Bush asked Trump for an apology to his wife.